Is the world ever truly your oyster? For a business owner, this is the ultimate goal. The dream is to live in a world where you have access to every door you want to walk through. Wherever your clients are, there you are as well. The problem is that for most business owners, this isn’t an affordable option. Availability is a privilege and the ability to be where your customers need you often feels more serendipitous than it does feel dependent on skill and aptitude in the world of business know-how. For the aspiring business owner, the start-up entrepreneur and even the large scale corporate executive, the answer to running a successful business on any scale is to know when and where to grow. In our ever advancing technological world, this often means growing your presence online. In fact, the best brick and mortar office won’t do anything for you if you don’t have an online presence, as well. Building your own office requires an extensive time commitment, not to mention a great deal of financial necessity. For a business looking to expand with limited resources, a brick and mortar office establishment isn’t always the best place to invest funds. This is where the Helix Workspace comes in. Helix offers virtual and flexible workspace solutions for businesses who are looking to expand fast. This gives the business owner the opportunity to focus on more pressing issues, like how to run the business, knowing that critical equipment and accommodations are provided for. 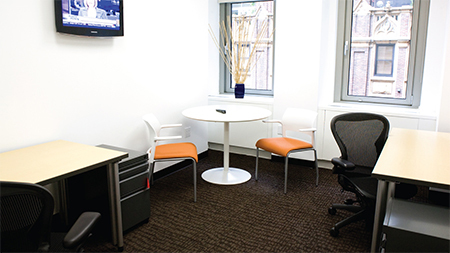 Helix Workspaces are available in the US and internationally, including in New York City where you can find yourself conducting business in a premium on-demand furnished office space that is complete with desk space and meeting rooms for you to focus on corporate needs. This creates a space where you can go to focus on your business, wherever that need may take you. Helix functions behind the scenes, giving the impression that the office space is permanently yours. And while you are using the workspace, it is! Helix works transparently with a quick and easy rental process that is sure to impress clientele while accommodating all of your business needs. When you need to grow, you need to grow fast. Helix Workspaces are there to help you make this happen. Take control of your corporate needs by giving yourself a home base to work from, wherever your business adventures take you.